Need a break from marinara sauces, pumpkin sauce or creamy, Alfredo-like sauces? Look no further. This Creamy Tomato Pumpkin Sauce is the perfect blend of garlic, tomatoes and “cream.” When I was little, it would be the dead of summer, and my mom would harvest tomatoes from our tiny garden. She’d chop up tomatoes, fresh basil and garlic, sauté the three into an easy sauce, and sever over pasta; I think this is where I got my inspiration. With leftover pumpkin and yellow squash, a simple sauce emerged fresh heirloom tomatoes (those colors! ), carrots and a little garlic. A splash of almond milk (or whatever milk you prefer) adds a new dimension to the sauce to perfectly prepare it for pasta. My New Year’s resolution might be to try new things because I find myself gravitating to recipes I’ve always thought about trying, but never do. Cue a tofu scramble. My only complaint is that I found myself adding copious amounts — for me “copious” is a shake or two — of salt. I rarely salt anything and it seemed strange I was even reaching for the salt shaker in the first place. I got this idea from Minimalist Baker, who is quite a genius with plant based one bowl meals, ones that are 30 min or less or with 10 ingredients or less. With that aside, the tandoori masala spice from Whole Foods was full of subtle flavor; it’s an Indian spice blend of cumin, coriander, garlic, ginger and cardamom. It seems like it would be great to coat some breakfast potatoes. The coconut oil seemed to complement the spices quite well too, as well as the mild kick from the jalapeño. What a different flavor profile for the morning! While I still like my eggs scrambled, Tandoori Masala Tofu Scramble is a savory, protein-filled, one-bowl wonder. Happy meatless Monday! I’ve been a little absent with school this past semester. Since we have one less class and one less clinical day, I hope to get more things written up and posted that I’ve already added to Instagram. To kick things off, here’s Vegetarian Sweet Potato “Spaghetti” using sweet potato noodles as the base. What an easy meal to whip together — sauté some veggies, open a can of beans, toss in the noodles and top with sauce. Now that I have a heartier spiralizer (thanks to the Inspiralizer from William Sonoma), I can’t wait to try making these at home! The ingredient list looks intimidating, but really the whole process is quite simple: make the sofritas, chop the salsa and assemble the salad. Easy, right? After taste-testing my mom’s Sofrita Burrito Bowl from Chipotle last fall, something about the lightness of tofu sounded great for a hot, summer day. I cooked the tofu with the same spices you would for chili and added it over chopped iceberg lettuce, avocado and red bell pepper. Throw together a homemade salsa. (You can literally throw in everything washed, whole and as is — i.e. full cherry tomatoes and cilantros with stems if you’re feeling exceptionally lazy and/or crunched for time.) 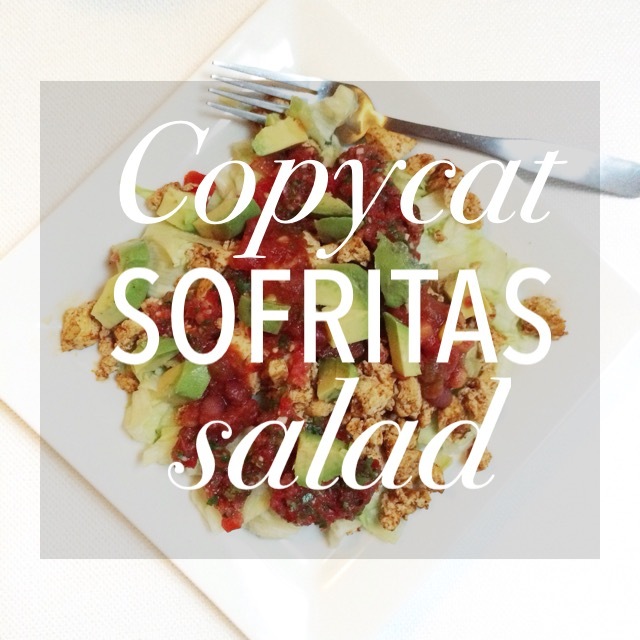 Everything comes together as light and fresh for this Copycat Sofritas Salad. Happy Meatless Monday!